I'm plugging away on the log cabin blanket. Now that the sections are getting wider, each one takes me that much more time to complete. Also, it's getting big enough that I can't carry it around with me, so my time to work on it is limited to evenings at home when the cats will consent to leave me alone, instead of insisting on sitting on my lap. So that's why I don't have a new picture this time--I haven't added many new sections since the last picture. 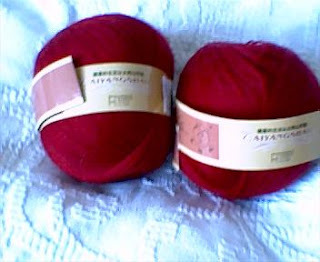 Anyway, last Sunday I happened to be near a yarn shop on the north side and went in just to browse and bought 1600 yards of red lace-weight wool. Why? Because it was pretty, and the label is in Mandarin, which I've never seen before. I have no idea what I'm going to make with it yet. I have several lace patterns but can't seem to pick one because they're all so beautiful. Yesterday at work I had to sit through a boring meeting and used the time to design a new sweater for myself. 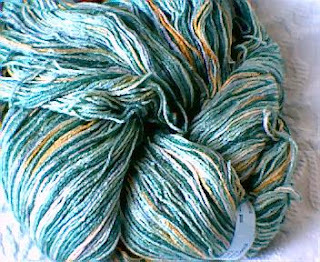 I bought some wool/silk yarn by Ellen's Half Pint Farm a few years ago at Stitches Midwest and have been hanging onto it, looking for the perfect pattern for it. I think it'll work with this new sweater I have in mind. I don't want to say too much more at this point in case I completely mess up the project, but if it turns out the way I hope, I'll post pictures. Tonight a friend and I are going to another friend's house for a craft night. We're going out for Ethiopian food first, and then we'll settle in for an evening of crafting and gossiping. Should be fun! Hope y'all have a great, crafty weekend, too.